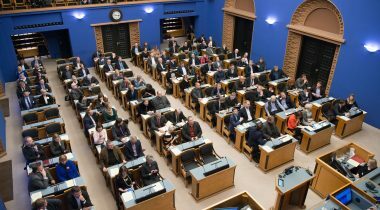 The Minister of Rural Affairs Tarmo Tamm replied to the interpellation concerning the conflicts of interest relating to the Centre Party in agriculture (No. 402), submitted by members of the Riigikogu Andres Herkel, Artur Talvik, Jüri Adams, Andres Ammas, Krista Aru, Külliki Kübarsepp, Terje Trei and Igor Gräzin on 11 December. The interpellation is connected with the allocation of pig breeding supports. In that connection, a number of questions were raised concerning political corruption, the selective character of the support for sow breeding, the conformity of that support to the state aid rules and its long-term purposefulness, as well as the fact that the persons who belonged to the advisory chamber for the minister had a conflict of interests when making decisions. The interpellators wished to know specifically which farms that had received supports were associated with Teet Soorm’s and Urmas Laht’s business interests through ownership relations. They also wished to know the amounts of the support that had been granted to the farms. Tamm replied that Teet Soorm did not own enterprises that would be entitled to receive the service for maintenance of a herd-book or an animal breeding register, or performance testing, from a breeding association. Urmas Laht is connected with public limited company Markilo – an enterprise of which he owns 9.625 per cent, which is entitled to receive the service for maintenance of a herd-book or an animal breeding register, or performance testing, from a breeding association in an amount of 121,018.58 euro, that is, 9.625 per cent of that amount is Urmas Laht’s share. Tamm explained that, in regards to pig farming, there had been one breeding association who had met the criteria for support at that time: the Estonian Pig Breeding Association. “Pig farmers cannot be applicants for the support for the breeding of farm animals. Breeding associations who have been granted an activity licence for keeping a herd-book or for performance testing at least one year before the beginning of the term for submission of an application for the support are entitled to that,” the minister said. He added that all pig farmers had at present, and had also had earlier, the possibility to become members of a breeding association and to enter their animals into an animal breeding register or a herd-book. Tamm said that, as at 1 May 2017, there had been 15,300 sows, gilts and boar in Estonia, of which the larger share – 10 036 – had been under performance testing. The 11,057 sows, gilts and boar kept in “Rakvere Farms” have been excluded from this calculation, because “Rakvere Farms” is not a micro, small or medium-sized enterprise and therefore it does not meet the criteria for recipients of breeding support according to the rules for state aid for agricultural producer. For the provision of the service of maintenance of herd-books and performance testing, support has been paid to breeding associations since 2014. “At the end of last year, the Government found an opportunity to raise the fee for performance testing, and the payment of breeding support became cost-based,” Tamm explained. He noted that the process of payment of breeding support had not been discussed at the Government’s negotiations. The conditions of application for and payment of breeding support have been adopted in the Regulation of the Minister of Rural Affairs of 15 September 2016. “In order that the principles of payment of the support and the bases for calculating the rate of the support were unambiguously understandable for all breeding associations operating in Estonia, and more transparent, two involvement events were organised in the Ministry of Rural Affairs last autumn, to hear the proposals of all parties,” the minister said. He added that invitations had also been sent to the breeders’ associations who had acquired an activity licence later and had not as yet qualified as applicants. “So actually everyone was informed and everyone could participate,” the minister confirmed. Tamm stressed that the advisory chamber for the minister did not make decisions, or interfere with the allocation of funds or the decision-making at any level. “This is not their competence. In the Ministry of Rural Affairs there are excellent experts in their fields, ministry officials whose advice and experience are also of help in the solution of various problems and issues,” Tamm said. The Chancellor of Justice Ülle Madise replied to the interpellation in connection with the proportional representation in municipal council committees, and the right of council members to belong in them (No. 395). The Minister of Entrepreneurship and Information Technology Urve Palo replied to the interpellation concerning hundreds of thousands of people being cut off from e-services (No. 391). The Minister of Education and Research Mailis Reps replied to three interpellations. They were the following: the interpellation concerning the implementation of the science policy decisions of the report of the Research and Development Council (2015, “Okk report”) in connection with the National Institute of Chemical Physics and Biophysics (No. 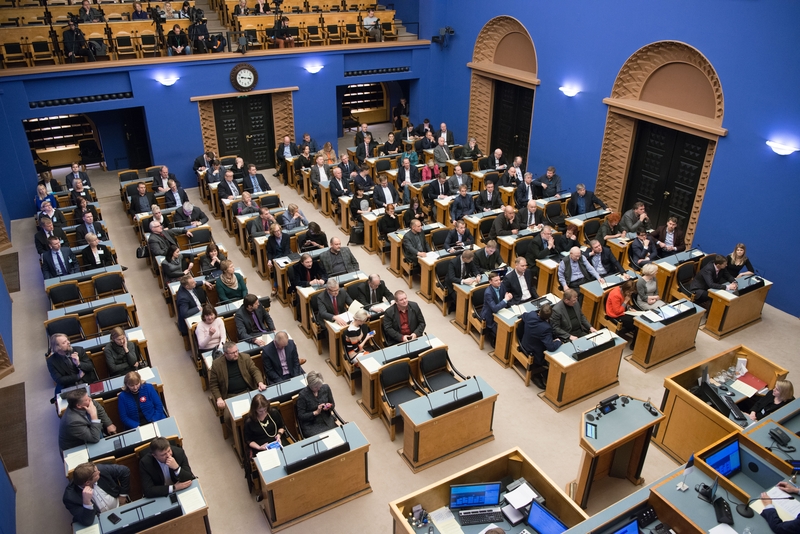 394); the interpellation concerning the potential changes to the evaluation at the Estonian language examination, and its connections with the Estonian language strategy (No. 404) and the interpellation concerning the relaxation of the evaluation criteria for the Estonian language examination (No. 405). The Minister of Health and Labour Jevgeni Ossinovski replied to the interpellation concerning the dental care service (No. 390). The Riigikogu did not discuss today the interpellation concerning the Green Paper on alcohol policy, and the failure of the excise duty policy (No. 398) addressed to the Minister of Health and Labour Jevgeni Ossinovski, because the interpellators withdrew it. The sitting ended at 8.46 p.m.